James Preller is a friend of Literate Lives. He is one of the first authors to make contact with us, and Karen and I felt like we had really made it when a real author commented on something written on our blog. He was the first author I hosted in the library when I switched jobs and our time with him was a huge success. This past weekend I got to spend some more time with him serving as his official host at the Dublin Lit Conference and I enjoyed every minute of it, hopefully he did too. 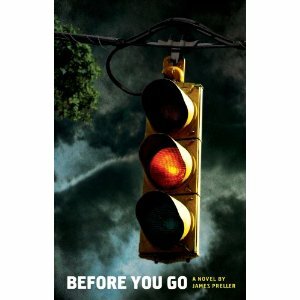 Before coming to the conference James sent me an ARC of his new YA title Before You Go. 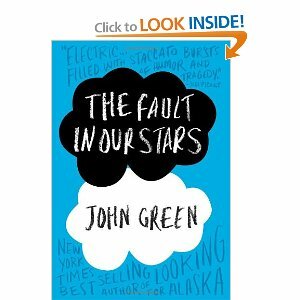 He and I have something in common on this novel, it's his first journey into the world of young adult fiction, and it's my first YA review. I'm saying that as something of a disclaimer, I don't claim to be an expert in this genre, and I don't really have anything to compare to Before You Go. I also don't expect to review too many other YA selections since they don't fit in our elementary library. That being said, here goes. The book opens with a car wreck. Four people in a car on a dark night on a lonely road. One of them is killed, but the reader doesn't know the identity. The rest of the story flashes back to shortly, several weeks before the accident and goes through the life of some typical Long Island teenagers. The main character, Jude, is working at a refreshment stand on Jones Beach the summer between his junior and senior years. Jude has never gotten over the death of his little sister when he was supposed to be watching her seven years ago, when he was only nine. Characters move in and out of the story, his best friend Corey, his co-worker Roberto, his first love Becka, his high school buddies Vinnie "The Italian Stallion" Puche and Lee. The characters move in and out interacting with each other in very believable ways, always making the reader which one is the victim of the accident. I changed my mind too many times to count and it really kept me reading to find out. The characters are real, and as a dad to a teen age son, the relationships between the boys is spot on! It's obvious that James has spent time with teen age boys because the conversations and insults exchanged are thing I've heard my son and his friends say to one another. I really thing boys are going to be able to read this book and find themselves in at least one of the characters along the way. The story is well written and again James Preller chooses word for maximum effect. As in his books for younger readers, Bystander and Six Innings the characters are strong and developed and easy to relate to. His words bring the reader into the story and create feelings that left me thinking about this book for a long time. As I said, this is not an elementary book, it is written for older students, so I won't be purchasing it for my library, but as a YA selection it's strong. What an amazing day yesterday was! 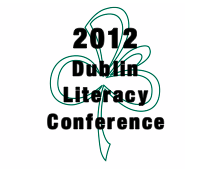 It was the annual Dublin Literacy Conference, and the energy at the location was contagious. From the moment I walked in the doors of the high school that serves as the Conference's venue, it was such a happy time. Seeing friends from the Dublin district in which I work, seeing friends from districts both near and far, and meeting new friends -- the conversations and hugs were a sign the day was going to be something special. We started the day singing and moving with Eric Litwin and James Dean of Pete the Cat fame, and then got to hear the keynote speech of the incredibly smart and talented reader/teacher, Donalyn Miller (aka The Book Whisperer). Wow! I have so many quotes from her session that I don't even know where to begin. The biggest takeaway is that we, as teachers of reading, need to have lives that are full of reading personally. Not a problem for me, but so great to hear Donalyn reinforce that thinking again. In the first breakout session, Bill and I presented what has become an annual event for us -- So Many Books, So Little Time. We spent 45 minutes sharing with a packed room the titles that we thought were incredibly special this past year, and even shared some amazing titles that have already come out in 2012. For those of you who couldn't be with us, or those of you who might want to share this list with others, here is the link to the google doc where the list lives. We hope you find it beneficial. After our session, I didn't have to go far to hear my friends, Nicole Kessler and Deb Frazier - their session was in the same room. Their presentation was on the power of using VoiceThread as a tool to help young writers express their thinking. Smart thinking that had me wondering how I could utilize this tool with my 5th graders. The afternoon keynote was given by the incredibly talented Sharon M. Draper. I've been a huge fan of hers since I read Out of My Mind. But hearing her speak, making some critical points about teaching while making us all laugh out loud, made me respect her all the more. I spent the final session of the day learning from the lovely Ruth Ayres. The focus of her conversation was how do we make mini-lessons relevant and meaningful. Whether you are in a district where you have a scripted program or one that doesn't, it is our job to make the lessons have a connection with the students. The other thing she talked about was a mirror image of what Donalyn had said in her morning keynote - in order to be a writer, you need to have a writing life. 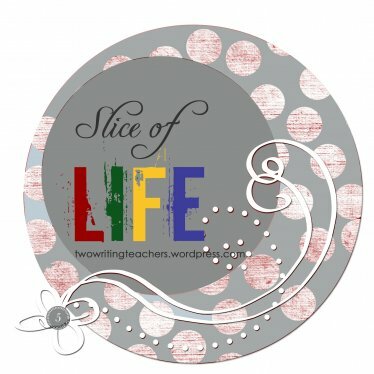 She strongly encouraged us to join her and Stacey at The Two Writing Teachers blog for the month of March. They will be hosting the Slice of Life challenge. 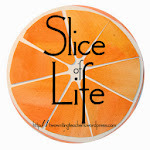 This will be an opportunity to write about a slice of life each day for that month. After being such a haphazard writer for the past year, I am looking forward to the challenge and the focus of writing every day. And I love when learning and thinking extends beyond the conference. It was great to continue conversations with friends and colleagues that evening; the wonderful food and drink didn't hurt, either. 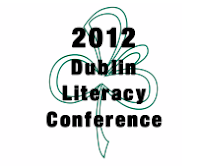 I'd like to say a huge thank you to all of the teachers on the Dublin Literacy committee. I know that they put in many long hours making this conference run so smoothly so the rest of us could sit back and enjoy the day and gather so many new learning. One final note - there were so many of us there tweeting out all the smart and important things that happened, that it became hard to keep track of it all. I'd like to say a HUGE thank you to Christine Yarzabek for finding a forum that captured all of the tweets with the #dublit12 hashtag. What a gift to be able to go back and read through everyone's thinking about this amazing day. In addition, if you couldn't be with us, checking out this link is the next best thing to being there. Sure hope you can join us next year for #dublit13!!!! On my last trip to Cover to Cover Sally handed me a copy of Giants Beware by Rafael Rosado and Jorge Aguirre. She'll be participating in the publicity of this new graphic novel and wanted to know what I think. I think I like it! 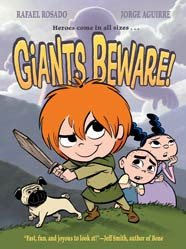 The heroine in the story is Claudette, a tom boy who dreams of nothing more than slaying giants. She is tired of the town historians telling the story of the battle against the Baby-Feet Eating Giant and how he got away. Claudette is tired of living in a town that lives in fear of the beast and wants to find him and slay him. Adding fuel to her fire is the fact that her father, the famous sword maker, was maimed by a giant during his giant hunting days. She wants to continue the family tradition, hunt down this gruesome beast and kill him once and for all. The scrappy Claudette enlists the help of her friend Marie, a wannabe princess and her brother Gaston, a wannabe pastry chef/sword maker. The three of them set off with Claudette's dog, Valient, on an adventure that takes them through the Forrest of Death where they encounter an old crone who used to be the Maiden of the Forrest. Then they come to the Mad River where they meet the Mad River King and his son the fish face. Throughout all of the adventures humor prevails. When they finally meet the giant the fun doesn't stop and with the help of some "magic" berries they conquer him too. While I'm not a huge fan of the graphic novel genre, I know a lot of my students are so I'm always on the look out for some good stuff to add to our collection. I'll be adding this one and telling Sally I like it a lot! 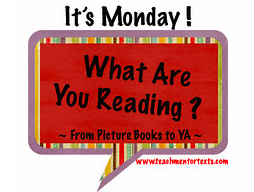 Even though I have a million other things I need to be doing (grading, parent-teacher conference forms, lesson plans), and a head cold to boot, I just had to jot down what I've been reading this past week. Kindle reading -- I'm a huge fan of spy and intrigue, so I finished Kill Shot by Vince Flynn. Please don't judge me by the title :) , but I love the main character, Mitch Rapp. This type of book and romance books are my once in a while guilty choices when it comes to reading. Max Quick: The Pocket and the Pendant - this is fantasy/mystery for children. I really enjoyed it and hope there are more to come. Thanks to Susan Dee for the recommendation! And as our committee had to make the final decision about which nonfiction picture book for this year's Cybil Award (to be announced Feb. 14!! ), I reread the wonderful books in this stack. 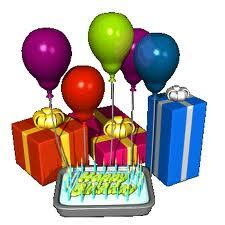 Each book brings a different gift to nonfiction reading and writing, and are definitely books you should know! So, that's my list for the past week and a half, but I am practically salivating over time to read next weekend. After reading the first chapter of The Fault in Our Stars by John Green, I knew it demanded every ounce of my concentration, so I needed to wait for the perfect time. Next weekend is that moment. It's loaded on my Kindle and just calling my name. I can't wait!! 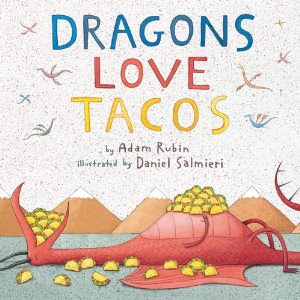 On our recent Central Ohio Bloggers day at Cover to Cover, my friend Beth showed me the galley of Dragons Love Tacos by Adam Rubin, illustrated by Daniel Salmieri, you know, the guys from Those Darn Squirrels another PIT favorite. That's me holding it in the photo. I read it in the store and of course, there I was laughing out loud in the store. The book will be released in June so place your orders now, you won't be disappointed. Obviously the book tells of the dragons' love of tacos, it doesn't really explain why they love tacos, it doesn't even really matter why they love tacos. It does, however, explain in detail that they hate spicy salsa. All kinds of spicy salsa, spicy green salsa, spicy red salsa, spicy chunky salsa, spicy smooth salsa, all kinds of spicy salsa. It makes their ears smoke, their noses snort sparks and gives them the tummy troubles. Most of the kids predicted the ending of the book, but it didn't take anything away from the fun, colorful illustrations. Just like Those Darn Squirrels, the book made all of us laugh and that's a good thing. Thanks again for joining us on our adventures with students and books! !